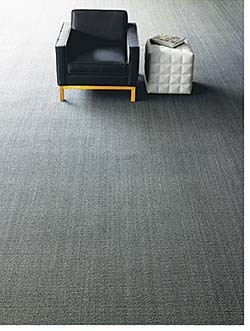 Follow Through Ultraloc broadloom carpet is 100 percent solution dyed, pattern loop construction, and uses Eco Solution Q Nylon fiber. One-sixteenth-gauge carpet has 4.5 stitches per inch and tufted pile height of 3/16-inch. Backing is woven synthetic with Ultraloc pattern. Carpet is 100 percent recyclable and has a total recycled content of 16 percent; Pre-consumer recycled content is 7.1 percent and post-consumer is 8.9 percent. Does not contain PVC, phthalates, or PBD/PBDE.